The Centers in the Primary Classroom CD contains reproducible literacy centers and work mats for individual children and small groups in pre-k to grade 2. They are colorfully illustrated with art4crafts clipart and address a wide variety of themes in language arts as well as math skills/topics for your classroom. Task board signs and suggestions for organizing and managing your centers are also included. Shipping and handling is free within the U.S.! Please see samples below. On this page you will find ideas for learning centers, as well as kid tested reproducible center signs and task board labels. You will also find book links to excellent resources for creating and managing literacy centers. Primary teachers at my school have found that focused literacy tasks and increased accountability at centers allows them to teach their reading groups without interruption! Please note: I showed the task board labels to my sister, Paula, another teacher in the family, and she says that I need to provide suggestions for materials and activities for each of them. So, thank Paula for the suggestions below! However, I agree with her. Upon returning from Linda Dorn's two week literacy seminar several years go, my thinking about literacy centers had been completely changed. When my primary teachers set up their new centers, we asked ourselves many questions. Why are we doing this particular center? (We don't want this to become crowd control while we do guided reading groups.) How will we hold the children accountable? How will we know they have completed the activity? What skill or standard is being addressed? Is the practice and application differentiated for a variety of skill levels? If you have other suggestions for the centers listed below, please send them to me in the guest book or via e-mail carl1404@msn.com. I will list it and give you credit for the idea. If you would like a label or sign for a center that is not listed or need more ideas, please let me know. Why Do We Use Literacy Centers? Should I Have Goals and Objectives for Literacy Centers? What Will I Need for Literacy Centers? Follow this link to download thirty-one full color task board signs for literacy centers. I put six to a page for each center so that teachers have enough for each group involved. All you have to do is print the pages you need, cut, mount on tag, laminate and place a magnetic strip on back and you're ready to use them! I suggest saving this file to your computer in case you want to make changes to any of the labels or create your own. Matching signs (see below) help children in locating the appropriate center. Because of the large number of graphics in this document, it will take more than the average amount of time to download it, so be patient! I plan to add more signs using the graphics shown below. Each new task board label link will be shown after the suggested directions. 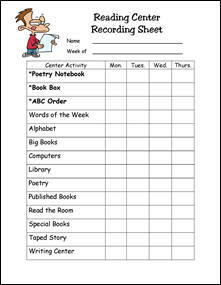 This reading center recording sheet was created and saved as a Word document so that you can modify it to suit your needs. This recording sheet add accountability to literacy centers and also serves as an informative piece for you to see what children are selecting and/or finishing during their independent time. I would suggest including required centers (in bold print) as well as weekly centers and "anytime centers" for children who finish early. This form may be used for center management regardless of the type of system you use (assigned centers or free choice). See Alphabet Avenue for suggestions and downloads for this center. I would include an assortment of alphabet charts, alphabet books to read, sorts for letter attributes (circles, sticks, colors, lower case and capitals, etc.) and a wide variety of letter fonts so that children begin to take a critical look at the way letters are formed. As a reading teacher, I didn't have this type of center. However, when I taught third through fifth grades, I always had a vast supply of materials that students could access for responses to stories and poems, and for enhancing their book commercials, book covers, and language arts projects. This included cardboard and fabric for polished pieces that were extra special, wallpaper sample books, construction paper, pinking shears and other specialty scissors, brads, a stapler and staples, and much, much more. Many of my more creative students loved looking at my teacher resource books for ideas for book projects and some even came back to look through them in middle school! This is a good center to use when putting on a play or puppet show, flannel board presentation. The students enjoy using materials like these to express their creativity. 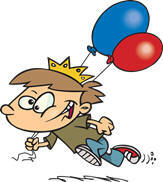 This portable center activity is for the birthday boy or girl. Gather picture books that address birthday celebrations and place them in a colorful backpack for the family to read together at home. Add a class journal so that the child can document his/her birthday with pictures, photographs and a short narrative to share with the class in the author's chair. You may use a birthday form for them to fill out. Include a birthday card and a personal message and send the backpack home for an interactive center. Be sure to include instructions for the parents and plan for summer birthdays. Your students will look forward to the day they get to take the backpack home. Provide a wide variety of books for browsing, some familiar and some new. Place your recently shared reading books and/or big books, add some pointers for your first or second graders and listen for eager reader's voices that might sound a bit like yours! Comfortable seating and ambience are important in a classroom library area. (How often do we sit at a table or desk to read our favorite novels?!) I like to include bean bag chairs, pillows, lamps, carpets and colorfully displayed books. Teaching Resource Center has "comfort critters." Mine is a six foot long caterpillar! Be sure to include an assortment of genre or author studies, magazines, and books that address whatever theme you are studying. Bookcases, baskets, bins and boxes all work well for storing and displaying your materials! A computer corner can be used for several purposes. Keep your goals and standards in mind when designing tasks for this center. You may want your students to work on their keyboarding skills, a Power Point or HyperStudio presentation (for older students), play an interactive reading or math game, or research material for a science or social studies report. Biographical studies can also be pursued via the internet. My first grade team uses the computer corner with Scholastic Interactive Readers. The CDs require the students to reread their current book and do several lessons to improve their skills. Here's another one of those that I have not observed in a first grade classroom (I had a cooking center every week when I taught kindergarten). 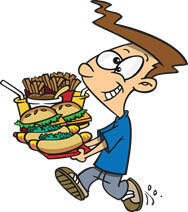 However, I do recall our first graders doing non-cooking food activities that involved following directions and sequencing, and I believe the tasks were related to a theme. For instance, during a spider unit, they made critters with Chinese noodles, chocolate and . . . I don't know what else. Anyone have any classroom friendly recipes they want to share? 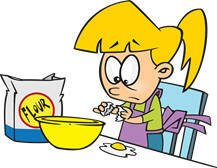 Send your recipe to me at carl1404@msn.com and I'll place it at this site with credit to the contributor! The students had to read the directions and make the item. Before they could eat, they had to write an explanation of how they made the treat. This was good for following directions, sequencing and retelling. This center may be used for reading and alphabetizing word/picture cards. Students can also construct, add to and illustrate their own personal picture dictionaries. This center is good at the beginning of the year for early/emergent readers and to build their confidence at being able to recognize words from their environment. I was able to order environmental drawings from RESOURCES for READING at 1-800-ART-READ. 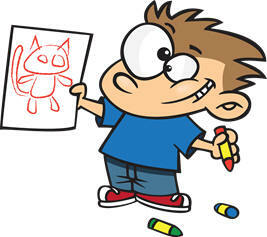 Some of the drawings are of logos that your children will recognize and the others are of common, everyday items. These are especially good for second language learners. 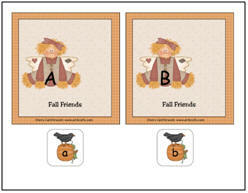 Students may use flannel board pictures for retelling old favorites. They may sequencing story pictures or alphabetize words. 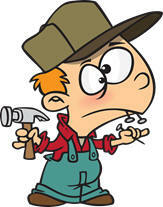 Students may also enjoy making flannel board characters to use with their own stories to share with the class. Thanks to Pepper Paden, a Reading Specialist and Title I teacher, for this set of task board signs. At this center, you may choose from any number of tasks, depending upon the grade level and the ability to work independently. You can put out an assortment of items, foods, etc. and have students sort and graph. They should also write "true" statements that summarize the results of the graph. One of our technological teachers has her first graders think of a question for their classmates, conduct a survey and then produce a simple graph in Excel to share with their classmates. 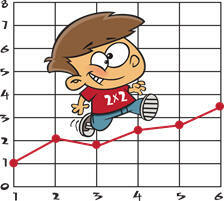 The teacher puts the graph into her class website for parents to see. Amazing, huh?! Since I saw many different grade levels during my work day, I had a variety of writing tools for my students to work with at this corner. This included white boards, eraser and pens, Magna Doodles, chalkboards, pencil and paper, marking pens, sand trays, Wikki Stix, stencils and more (not all out at the same time: too many options). At the beginning of the year I gave emergent writers the opportunity to write focus letters on a large sheet of butcher paper in a variety of sizes and colors. Brain research shows that children need flexible practice, often writing with the whole arm in motion, horizontally (at the table) and vertically (on the large white board or butcher paper mounted on the wall or cabinet). Our first grade teachers used this to practice writing high frequency words in many different forms and sizes. 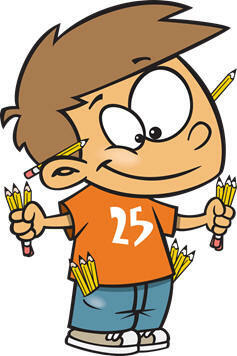 See Teacher Trail for pencil possibilities and tantalizing tools. After listening to many squabbles from small groups about turning the volume up or down, I decided to purchase several inexpensive tape players and earphones so that each child was responsible for the controls. Since I only had two students to a center, this was manageable. I placed the tape player, earphones, tape and book in a gallon sized freezer bag. Magnetic letters stick to many surfaces that make readily available centers in out of the way corners of the classroom. For example, I had several metal cabinets, a small refrigerator, the white board, cookie sheets, and serving trays that make this center an easy one to set up. You can have the children sort letters and/or build words. Tasks may be similar to those in Word Way. However, children appreciate the opportunity to have open ended centers, so I often allowed them to explore with the letters and record their results or read them to a friend. These are often used for practicing high frequency words. 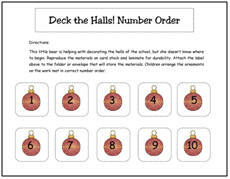 Deck the Halls Number Order . . .
and lots more on a Center City CD! 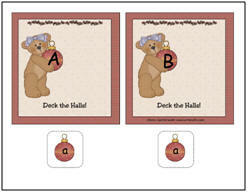 Daily Problem Solving Math (one for each season for Grades 1-2 and Grades 2-3). 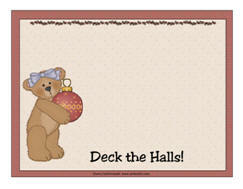 Each of these sets have 11" x 17" charts with an illustrated math problem that follows a seasonal theme. They are good practice in using what I like to "math language." Thinking Skills for Grades 1-2, Grades 3-4 and For Grades 5-6. Each of these sets have 44 illustrated charts and accompanying student pages that encourage children to think critically and logically. 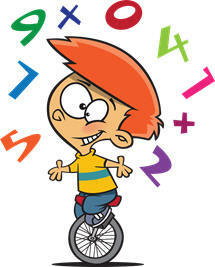 They have another set for upper grades called Math Brainbusters for Graders 3-4 and Grades 5-6. Place each child's name in a three-ring pencil case along with the letter tiles or magnetic letters with which to build the name. 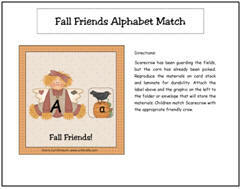 Children can match pictures of their classmates with their printed names, place the names in alphabetical order, and put together teacher created puzzles of the child's name. Research shows that young children quickly learn to recognize the names of their friends, so it is appropriate to use names as anchors for learning consonant sounds and for emergent writing. Check Linda Dorn's Apprenticeship in Literacy for extensive ideas for a Names Corner. When our first graders were studying Japan, the teachers put out an origami center. The students had to follow directions to create their origami. I liked to use cut up poetry transparencies so the children can rebuild the poem and read it from the white board. I have seen teachers place the whole poem on the overhead projector and students are required to use whiteboard markers to highlight the rhyming pairs (different colors for each pair). Transparent letter tiles or magnetic letters may be used to build the words of the week, spelling words, or word family words. There are commercial games available that use transparent sheets for reading activities. Students may also use an overhead pen to practice writing and reading high frequency words. Most of our K-3 classrooms have fifteen or twenty colorful pocket charts (in many shapes and sizes) that are used for a variety of purposes: poem of the week, vocabulary, chants, charts, sequencing, sentence building, sorting pictures and words, etc. 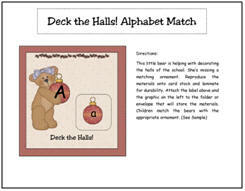 However, Pocket Place is an area set aside for a specific task for differentiated instruction. One of my favorite uses is for my largest pocket chart. My groups love to play Junior Jeopardy, a game that is suggested in Words Their Way. To save time and energy for the teachers on my staff and in my university classes, I have created print ready cards for different spellings for each vowel. (For instance: ay, ai, a-e, a, etc.) 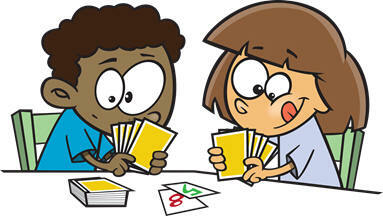 Each game comes with directions, clues and cards and a cheat sheet with all of the answers for the teacher! These games are available on the Word Way page of this website. The children follow the directions and make an art project. If they don't read and follow the directions, the project often doesn't work out. Storing sentence strips is easier than it was when I first started using centers in the sixties (I'm showing my age!) There are commercially produced sentence strip containers with dividers or you may use wall paper paste trays that are placed below the pocket chart for easy access. This is an excellent place to reinforce story sequence. Children can reconstruct stories, songs or poems that were introduced during shared reading and then reread them with a pointer. For nonreaders or emergent readers, use rebus stories. Gather a large assortment of publishing materials, including writing tools (colored pens, pencils, markers), a variety of writing paper, stationery, postcards and envelopes (colors, sizes, and shapes), blank books, journals, dictionaries, writing prompts, editing posters, charts describing what good writers do, checklists, and construction paper for covers. You may also want to include samples of good writing, rubrics, and picture book samples of letter writing, journals, and postcards (see writing bibliography). Work in progress needs to have a designated spot and so does work that is ready to be checked by the teacher for publication on the computer. Organization and storage of materials is critical to the success of Publishing Place. Children need to know exactly where to put things. Labeled trays and bins are helpful. Placement of this center should allow for visibility and easy access to the classroom names chart, alphabet chart and the word wall. What do they write about? Children may write responses to stories, retellings and/or summaries, or copy changes of old favorites. This is also a good place for writing and publishing personal narratives. This is a good place for alphabet jigsaw puzzles for younger students and word search puzzles for older students. Again, I like to have a variety to hold student interest and I would suggest large floor puzzles as well as table sized puzzles. After completing an alphabet puzzle, allow students to use a pointer to "read" the puzzle, touching each letter as they recite the alphabet. 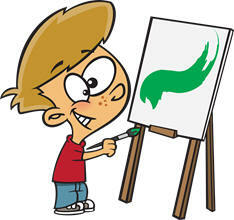 Provide a wide variety of colorful pointers for children to use while reading text that is displayed around the room. They may reread familiar student generated books, environmental labels, word walls, ABC charts, and pocket chart displays. I like to hold students accountable for their time in this rather informal activity. I provide a "Write the Room" form for them to record and illustrate words read from the classroom environment. When they come to their reading group, they read the words to the group/teacher. If you have a poem of the week, poetry anthologies, or work with Mother Goose, place the poems in the Rhyming Road center. Add a pointer or two and let them practice what is now "familiar" reading. Copy the poems on sentence strips and have students place them in the proper sequence before rereading. Combine the overhead projector and the rhyming center in a portable center. Make two transparencies of the same poem. Use one on the overhead in conjunction with the white board. Students can highlight and read rhyming words on the board. Cut the second transparency into strips for children to sequence and read from the white board. Store strips in a labeled three-ring pencil case that fits in a binder along with the transparency of the poem in its entirety. I usually put out one poem to avoid mix ups, but this solves storage and management issues. 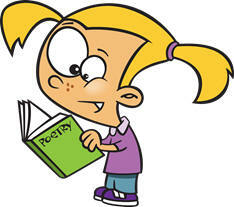 Options: poetry charts, poetry cards, poetry books, class books of poems, and poem of the week to illustrate and add to individual anthologies. 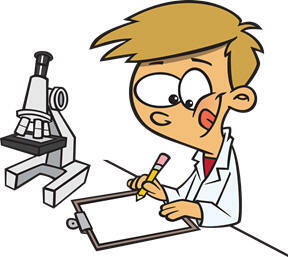 Students are required to learn how to do observational writing in science. I love what one of my first grade teachers, Carol Filloon, did with this one. During one period of study, she had a different pet brought in each week by a student (it could be the classroom pet). Two students equipped with clipboards and recording sheets parked themselves in front of the cage or aquarium to observe and record. It was wonderful! The teacher provided related books for students who were interested in looking into their topic a little bit further. Of course, this was not the only way she used this center, but it was one that was well remembered by all who saw it happening! There are many different ways to create your own sentence building center, but I took the easy way out: buying ones that are ready made. ©Lakeshore's Sentence Building Pocket Chart, which is color coded for success. This is an example of completing cloze sentences, filling in the blanks and using context clues. I add student names to the nouns pack. ©Lakeshore's Make a Super Sentence Flip Boards. Students can build hundreds of sentences with these color coded sentence parts. Each kit comes with three different boards and a teacher's guide. Children love to use these because they so often come up with something so preposterous that it gives them the giggles. I particularly like this kit for second language learners who need to learn about sentence structure. Word stamps are available for children to stamp and illustrate sentences. This is the place to put sequencing activities that you create or buy. 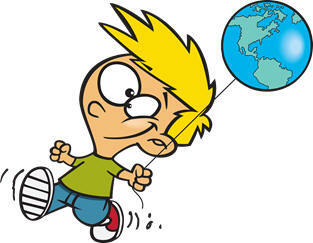 It will reinforce comprehension of stories, sequencing lines in a memorized poem, science concepts, etc. If you look at Evan-Moor's Alternatives to Worksheets, you can find hands-on ideas for crafty presentations of first, next, then and finally for retelling. Shopping City is a great place to use your environmental print and to allow beginning writers to use their knowledge of sounds and letters to create "shopping lists." 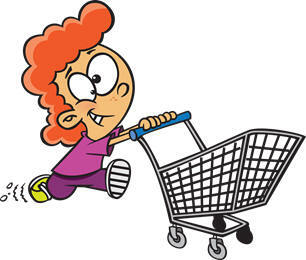 Provide a shopping cart (available at many stores), grocery items (nonperishable plastic and paper, of course), catalogs, and wish lists for recording the items your students would like to buy. Good use for Daily Geography. Once you have finished several days lessons with the students and modeled how you want it completed and reported, the students can go on their own. Also good to use with Rookie Reader map and globe books or books about different countries. Students enjoy working with the globe and maps. This is also a great way to get those social studies standards in that you don't have enough time for! Sorts, sorts, and more sorts! Use Words Their Way and All Sorts of Sorts for ideas for developmental word and picture sorts, reproduce the appropriate pages on vellum, and laminate for use. I store mine in labeled three-hole pencil cases for easy access in a notebook. Full color picture and word sorts are available in Word Way. These sorts address a variety of orthographic features, grammar (nouns and verbs) and other skills that I have found lacking in some of my students. I'm picky and prefer pictures in color and that's why I have developed my own. Enjoy! This particular activity teaches students to look for patterns and to make connections. Brain research suggests that we can learn through analogy: What do already know that will help us with this new word? If children understand how the spelling system works, then they can come to feel they have some control over it. Spelling Space would be a good place for students to practice their spelling words. You may choose to use special worksheets for your students so that they have the opportunity to practice, cover, guess and check. There are many commercially produced programs that have spelling practice sheets. This would also be a good place to use magnetic letters or tiles to practice building words within a word family, adding suffixes to root words and practicing spelling rules such as drop the e before adding -ing or doubling the consonant. Let them see writing published and displayed. Focus on spelling at appropriate times during the writing process. Teach children that "spelling" is a strategic thinking process, not a memory activity. Teach children when, where, and why spelling matters. Encourage any attempt students make to spell. Help children to move to whatever the next stage of developmental spelling is for them. Provide information about words when children need it. Help children to link words into "word families" which have the same spelling pattern. Letter stamps, thematic stamps for "stamp-a-story," or any stamps you happen to have can be used for making greeting cards, story illustrations, words and patterning in math. This designates the teacher working with the guided reading group. Use it to let your students know when you will be working with their group so that they can pace themselves at their centers. According to one first grade teacher, this is a good center for rereading old Weekly Readers for familiar reading and doing the back puzzle page to check for comprehension. The students enjoy "reading the newspaper" like their parents. Our local paper also has a children's newspaper insert that I used to laminate and collect for free reading. This center would be a good spot for those, as well. Word building is the task required of children in Word Way. A teacher proudly showed me her new word building center when we first began looking at centers with literacy development in mind. She had colorful magnetic letters and metal boards for her children to work with, but when I quizzed her about what words they were expected to build, she decided she needed to be more explicit with her instructions. Were they required to build spelling words, sight words, word family words? How do you know what words they've built in the center? Where is the accountability? Our students now know that they need to record their efforts in a word building log on a daily basis. In my classroom I use small baskets that I set up ahead of time and I usually focus on orthographic "chunks" that children find difficult when decoding and/or spelling. This information is derived from two sources: John Shefelbine's Basic Phonics Skills Test (California Reading and Literature Results Project) and Johnston's Spelling Inventory (Words Their Way). Many commercial products are becoming available to make our jobs easier. I highly recommend the tiles from Educational Insights, Inc. The tiles come in blends, vowel teams, short and long rimes, diphthongs, and more. You can purchase a kit with word building trays and task cards. Children need to look at chunks in words in order to develop fluency and automaticity. Too often we see them stuck at "spits and starts," trying to produce every single grapheme's sound. We all know that doesn't work! W.O.W. stands for Words of the Week. Our first grade teachers focus on several new sight words each week and add them to their word walls. This corner gives children the opportunity to practice building the focus words with a variety of tools. I have developed a Working with WOW Words work mat for students to use. Download and print, mount on vellum, laminate and place in the center along with the appropriate word tiles, magnetic letters and letter tiles. We make sure to change what we do with this often since what works one week may bomb the next. We use concrete objects as well as paper and pencil, crayon, water, noodles, wikki sticks, clay, etc. anything and everything that makes them think they are doing something different. We rainbow write, use cotton balls, sand, pudding, and toothpicks. Any other ideas out there? Send home an accounting of a week's worth of activities. Children can make an X through the centers that they visited throughout the week. This provides parents with a better idea of what goes on during literacy center time. This is an assortment of covers for journals or logs that students use to record work that is completed in centers. This is that accountability piece that is missing for some us! 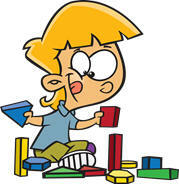 Children can record words built in a Word Building Center, write rhyming words that they discover in Rhyming Road, etc. I will be adding to this document during the next few weeks. I'm teaching a Literacy Center course at UCSD again and always add new things to the coursework and hence, to this site! Finney, Susan. Keep the Rest of the Class Reading & Writing While You Teach Small Groups. New York, NY: Scholastic. Fountas, Irene, and Pinnell, Gay (1996). Guided Reading. Portsmouth, NH: Heinemann. Holliman, Linda (1996). The Complete Guide to Classroom Centers. Cypress, CA: Creating Teaching Press. Marriott, Donna (1997). What are the Other Kids Doing? . . . while you teach small groups (1-3). Cypress, CA: Creative Teaching Press. Opitz, Michael (1994). Learning Centers. New York, NY: Scholastic. Schlosser, Kristin and Phillips, Vicki (1992). Building Literacy with Interactive Charts. New York, NY: Scholastic.